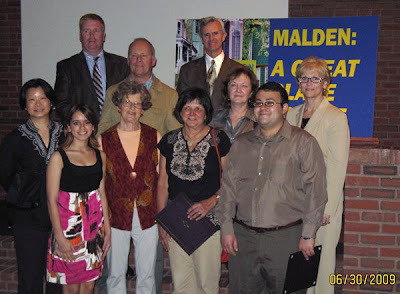 Local artists received City Council and Mayoral Recognition for participating in the Features of Malden Art Contest. Shown with the Artists are: Councillors James Nestor, far left, and Judi Bucci, far right, and Mayor Richard C. Howard, back center. Twelve Malden artists submitted art work for the first-ever “Features of Malden” Art Contest, sponsored by the City and a private developer. Capturing first place was Ose Manheim for a colorful photo collage of various houses in the community. The winning art work including the caption “Malden: A Great Place to Live” will be installed as part of the decorative fence panel project along Main Street, opposite the First Baptist Church. Artists were inviting to submit all types of art work for the contest, which was sponsored by Mayor Richard C. Howard, the Malden City Council’s Citizens Engagement and Downtown Revitalization and Housing Trust of New England LLC, developer of a proposed mixed-use residential/commercial development known as Main Street Residences. Malden artists were invited to capture their view of what makes Malden a unique and beautiful city. Entries were reviewed by a panel of judges consisting of a representative of Mayor Howard’s office, a representative of Housing Trust of New England LLC and members of the Citizens Engagement and Downtown Revitalization Committees. The winner was announced at this week’s City Council meeting by Ward Four Councillor James Nestor, whose ward includes Malden Square where the fence panel project is located. All of the artists were invited to the meeting and were given citations commending them for their work and participation. Noted Councillor Nestor: “This is an exciting project that has helped beautify that section of Main Street. It is great to see our local artists embracing this initiative.” In addition to the winner, the other entries included watercolors of Fellsmere Pond and Malden Public Library, photographs of well-known Malden buildings and places including local parks. Ose Manheim: The winner of this year’s contest, Manheim is a native of Stockholm, Sweden, Manheim has studied photography, pottery, and portrait drawing. She has also done illustrations for children’s literature. She has exhibited her work in several area galleries including Malden and has been a participant in the city’s Window Arts Malden Project. Linda Waite: A Malden resident, Waite graduated from Malden High School and was accepted into a Fashion Design program at Chamberlyn Junior College in Boston where she received her associates’ degree. She owned a dressmaking business for 10 years, specializing in the creation of wedding gowns. She later began working with pastels and does pastel portraits of children, pets and landscapes. She works as a self-help coach for Sun Life Financial. Rod Peterson: A native and current resident of Malden, (Malden High School class of 1967), Peterson started painting in the early 1970’s just after he finished his training as a social worker. He has been involved in a number of individual and group shows over the years, has been a past member of the South Shore Arts Assoc., the Copley Society, the Marblehead Arts Assoc., the Reading Arts Assoc. and the Malden Guild of Artists. He is currently an Artist Member of the North Shore Arts Assoc. For the past fourteen years he’s worked and exhibited with other area artists in the Malden Sketch Group, a weekly life drawing and painting group currently meeting Monday nights at the Oak Grove Community Building. Peterson paints primarily in watercolor and enjoys working outdoors doing landscapes or cityscapes. Joseph Patrick Cerminara: A Malden High School graduate, Cerminara has exhibited in the school’s Blue and Gold Gallery and one of his pieces captured honorable mention from the annual Boston Globe Scholastic Art Awards. Most recently, Cerminara’s focus is on illustration, fine art and graphic design. A 2005 graduate of The New England Institute of Art in Brookline, he has actively pursued a career working in such companies as Houghton Mifflin Publishing, BlackSheep Marketing, and working freelance for at least two startup businesses. In addition he is actively involved in artistic competitions including a logo design contest in which his design was chosen to represent the Massachusetts & Rhode Island Antiquarian Booksellers organization. Kathleen Conners: An art minor in college, Conners was introduced to the many and varied art mediums and has dabbled in most of them throughout her adult life, all while performing her duties as a full-time teacher and wife raising a family. Now that her family has grown and she has retired from teaching, she has been able to actively pursue her art interests. Over the years she has found a love for the fabric arts (quilting) and watercolor (paintings). Lisa L. Sears: A visual artist and editor living and working in Malden, Sears earned a BFA in studio art from the School of Visual Arts, University of North Texas with additional study at the University of Texas in Austin. Working in water-based media, she paints and draws on canvas and paper. Occasional ventures are made into black and white and digital photography. Vanessa Ly: Post graduation, she began work in the architectural profession. Working in this field, she saw opportunities where architects and designers could create environments that could possibly promote diversity and community development; it was a field that allowed spaces to communicate with people. After a two-year stint in the architectural field, Ly began focusing on illustrations and graphics. Designing and drawing became outlets that allowed her to give life to the imagination. Sand T: Sand T obtained a Master of Fine Arts Degree from Tufts University and the Museum School. Her working format is mixed media paintings. She has exhibited her work in New York, Iowa, Connecticut, Maine, Massachusetts, Malaysia, Singapore and Taiwan. Her work resides in public and private art collections world wide. Sand T was awarded Exceptional Work Award this June for her epoxy resin painting submission to a juried show at TLGUTS. In addition, she was awarded Solo Exhibition Award for her TRACES Series submission to Caladan Gallery this past May. Sand T is highly skilled in community building, art promotion and visual merchandising. She operated artSPACE@16 in Malden and S.T Gallery in Boston's Fort Point district from 1998 - 2008. After the closing of artSPACE@16's physical gallery space, Sand T continues to advocate for the arts community on the World Wide Web. MAKING THE ART SEEN, a virtual gallery features art interviews is her new art initiative created in April 2009. Ryan O’Malley: As a lifelong resident of Malden, O’Malley spent much of his childhood playing in the Malden park system, particularly at Coytemore Lea Park. A graduate of the College of the Holy Cross in May with a Bachelor of Arts degree in Classics, the study of Ancient Greek and Latin, O’Malley recently became a Park Ranger for the Massachusetts Department of Conservation and Recreation, working primarily in Revere and Nahant shorelines. Art has played a huge role in his development and stuck with him throughout his time in the Malden Public School System as well as at the college level. Elsa Basile: Basile, 21, has studied art at Pensacola Christian College. She enjoys painting with oil paints, but has experience in many mediums including pencil, pen, charcoal, chalk, pastel, watercolor, and acrylic. For this particular drawing of the Fellsmere Pond, Life Within, I used two oil paints - white and burnt sienna. Her portfolio consists of various still lifes, landscapes, and portraits of all ages. Bala Muthukaruppan: A software developer by profession at HP, Muthukaruppan has a strong passion for the arts. She has been influenced by many diverse cultures having lived in six different countries—India, Bahrain, UAE, Sultanate of Oman, Qatar and the United States. She is the mother of a two-year-old. Eaden Huang: A local resident, Huang is a photographer who has done several local exhibits. All of the art work is currently on display until the end of July on the sixth floor of Malden Government Center, 200 Pleasant St., outside of the Mayor’s Office. "There's big community arts news from Malden, Massachusetts. The tiny community (56,000 pop., five miles square) five miles north of Boston is pushing hard to make room for art. Malden Redevelopment Authority is acquiring vacant downtown space for studios and is converting the former Sacred Hearts Convent into artists' live/work space. Galleries are opening around Malden Square (the mayor even has one in his office) and plans are being laid for an artists-in-the-schools program. Local arts organizer Sand T is encouraging use of every building in Malden for the arts and has opened a gallery her own garage called artSPACE@16. Sand T's Web site is a good model grassroots for advocating city redevelopment through the arts. .."
Article courtesy of CAN CommunityArtsNetwork APInews, June 13, 2005. Art in the Public Interest.